Briefly provide highlights of your education and musical career. 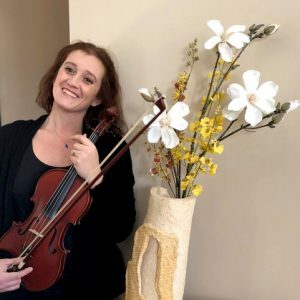 I’m an Italian violinist with 18 years of extensive experience in symphony and chamber orchestras, opera, and violin education. After receiving my BA in violin from the Instituto Pietro Mascagni in Livorno, I debuted in the Orchestra Giovanile Italiana. I also played as a Concertino violinist in the Florence Symphonietta, under the direction of Maestro Pietro Bellugi. Subsequently I joined the Puccini Festival Orchestra in Lucca, specializing in opera repertoire. In 2013 I moved to the United States and played with the Takoma Ensemble Chamber Orchestra. I currently work with the choreographer Mimmo Miccolis and the Washington Ballet. What led you to become involved in A Musical Heart? When my Dad was sick with cancer at the hospital, I played for him. The music was the only means of communication with him, and I decided I would do for other people. When I arrived in the United States and tried to make sense of my new life, I was lucky enough to meet Nina and learn about her incredible project. I’m lucky and happy to be part of the Musical Heart family. How does your experience playing for a public audience differ from playing for a single hospice patient? Playing for an audience creates expectations in those who listen and in those who play; it creates both satisfaction and disappointments. Playing for one person creates a different intimacy. It becomes a conversation made of looks and emotions. As you can not foresee a patient’s reactions, you cannot even foresee yours; each time it will be like the first time. For a patient you will always be precious, because you are there to give the most important thing you have – your time. Your music is just for him and becomes “unique”. For a public concert the program is established beforehand, and there is no room for changes. Music for a patient can’t be established beforehand, because even a single note can be what the patient needs. Sharing music in a concert hall puts the musician in a privileged position, where he or she is master of what happens. In front of a patient you are vulnerable. A person at a concert is usually glad to be there, but patients in hospice often have a different mood because of pain or the nearness of death. When they listen to music, they probably think about the past, the story of their life. Sometimes they don’t ask for you to play, but usually they relax and accept your presence and your music. I have to be completely sensitive to the patient and go with no agenda. I am not the protagonist. They are. Please describe a memorable, touching moment in which you felt your music truly aided and/or lifted the spirits of a hospice patient. I believe that every achievement, like a smile, a tear, or a breath that changes its rhythm with music, is a special and unforgettable memory. One memory that will always stay with me is when I visited with a patient who had once been a violinist. During the visit the wife brought him his old violin. The patient started to play, but no sound came out; he was physically unable to do it. I moved where he could not see me, and I started to play. I will never forget the joy he had when he believed that he could still play the violin. His eyes brightened. The feeling he was still playing was the only thing that could relieve his pain at that moment. It is for these moments that you choose to do what you do.